“The Power of Collective Action.” This was not only the course name, but also the organizing principle of a class that has forever influenced my understanding of the Civil Rights movement, and my own sociopolitical outlook. I enrolled in this Experimental College course as a first year student, thinking that I already knew most of what there was to know about the Civil Rights Movement, the Freedom Rides and the non-violent struggle that spilled into schools and coffee shops, churches and military canteens until finally, after far too much blood was shed and far to little change was conceived, a Civil Rights Bill was passed. Then, in came instructor Davis who had earned a lifetime degree in community organizing and black studies as a participant in both the Civil Rights Movement and later the Black Power movement. In his course I quickly discovered that what I thought I knew was surface knowledge, and even that proved to be embarrassingly little compared to the lived experiences of someone who actively participated in these struggles. The map is from an Associated Press article in February 1962. 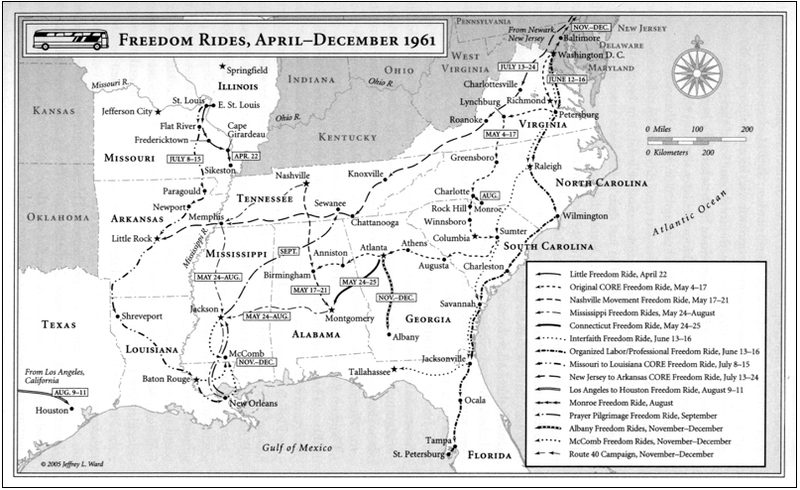 “Note that the map shows only a few of the more than 60 Freedom Rides that criss-crossed the South between May and November of 1961” (http://www.crmvet.org). Instead of preaching fantasy, he educated us on the facts, which often went a lot deeper than spontaneous sit-ins. He talked about the strategic levels of organization, education and commitment that many Freedom Riders, CORE, SNCC and SCLC members had. He spoke of the Birmingham School, and his own revelations and decision to leave home in the Northeast, put off college and go down south to make a difference. He introduced us to Sammy Younge, Jr., Fannie Lou Hamer, and countless others who might never make it into our textbooks. Most of all he spoke about the power of collective action, an idea that seems to elude so many people today, particularly young people color. And in a post-civil rights, post-apartheid, post-911 world, this singular idea can still motivate thousands, because it affords group agency to the seemingly agent-less. I should also mention that this concept was recently (re)worked in Tina Rosenberg’s Join the Club: How Peer Pressure Can Transform the World. Upon listening to some of the examples Rosenberg draws upon, I think it fair to say within the context of the U.S.; that to understand the Freedom Riders, why they did what they did, putting their lives, careers and familial relationships on the line, is to gain insight into every other major sociopolitical movement in this country since this time. LIFE Images Civil Rights: The Freedom Riders – Photo Gallery – LIFE. You are currently reading Fifty Years in May: Freedom, Faith, and the Original “Get On The Bus” Soundtrack at The Prude Papers.